Start your IT Outsourcing project with Pentalog! 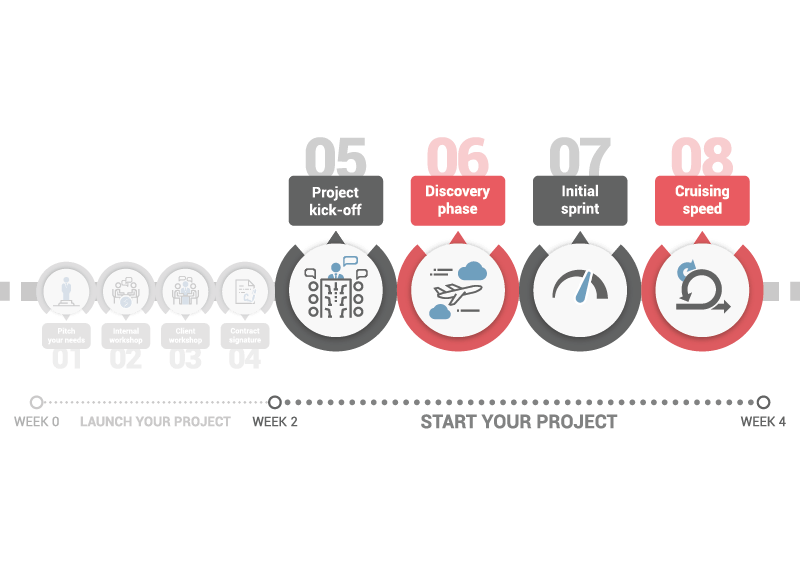 Pentalog Software Factory can help you launch your project in only 2 weeks and then ramp up your team in an additional 2 weeks. To achieve this ambitious goal, we rely on our 850 full-time front-end and back-end developers and on our 200 000 IT tested engineers to develop your project and accelerate your time-to-market! This is the official project launch. The project status will transition to “100% operational”! In this phase, the Pentalog team will clarify, together with your team, all the operational details of the project (organization, communication, methodology, roles, and resources). The project manager will also explain the ramp-up planning and the risks (along with the action plans to address them) associated to the project. One of Pentalog’s most notable practices is to send part of the project team to your offices to become acquainted with your corporate culture. This will enable easier co-ordination and a smooth transition into operating procedures. During this second step, the project manager will start to fund the resources needed for the project using the Pentalog cloud provisioning tools. He will also start to complete the product backlog. The team is now complete and ready to start working on the project. This initial sprint is focused on implementation. The team will set up the development environment, perform integration testing, and do a complete project assessment. In other words, the team will learn how to work together in this new environment! They will also finish the backlog of the sprint 1. The duration of the first sprint is likely to be different than the following sprints. It is important to spend some time setting up a solid framework to ensure a successful project! The project is on the rails. The sprints are moving forward and you will receive an operational version of your product at the end of each sprint until your product is completed. We also invite our clients to visit the Pentalog team at their Delivery Center. This is useful for keeping in touch with the team and gives you the opportunity to explain your vision for futures versions of the product.